A detail statement of the problem: That you would like to investigate. Methodology and presenting secondary data: Based on the conceptual framework, research aim(s) and objectives, you need to provide a detail description of the data collection methods and tools, data sources and the methods/tools that you will use to analyse the data. Price war is one of the devastating forms of interplay in the competitive world that have remarkable consequences. Companies suffer huge losses in terms of customer satisfaction and consumer equity. It is often assumed that lowering the prices of the services would attract more customers and this will overall increase the productivity of the companies. Therefore, this decrease in price often affects the overall productivity of the companies. This pricing pressure increases the level of competition among the companies and therefore, this affects the quality of the products. Customers want their products to be of high quality and therefore, this price war ultimately causes consumer dissatisfaction. The following research study will discuss about the impact of price war on product’s quality. Furthermore, this reduced quality of products overall causes dissatisfaction and this will also be discussed in detail. It has been seen that these free calls and internet services attracted the customers and occupied almost 60% of the market. This Reliance Company provided 4G internet at relatively lowest prices and this grabbed the Indian market. Therefore, this initiated this price war among the companies and affected the other leading companies. Bharti Airtel limited is one of these affected companies and this price war affected the quality of the services. Moreover, this price war also affected the customer's perception about availing any services and therefore, the overall market structure of the company got affected. Bhadani, Shankar & Rao (2016) opined that price war among companies is one of the leading reasons behind increased customer dissatisfaction and resistance of the consumers from availing this Indian market. Aim: The main aim of the research proposal will be to analyse the impact of price war on quality of products and customer dissatisfaction in case of Bharti Airtel telecommunication industry (BAL). What is the impact of market competition on the quality of products in case of Bharti Airtel Limited? What is the impact of market rivalry on customer’s perception regarding any products? What is the influence of price war on the revenue loss of telecommunication industry? What are the ways that could be used by telecommunication industry in order to increase customer satisfaction? It has been seen that price war has a huge impact on the quality of the products and services. Sagar et al. (2015) commented that in case of Bharti Airtel Limited, there has been reduced number of consumers due to the increased price war among the competitors. However, Kasana & Chaudhary (2014) opined that most of the companies believe that reducing the price range would attract more customers and this would overall raise their income and productivity. Therefore, most of the companies exhibit huge loss due to this increased price war within the Indian market. It has been seen that about 49% of Indian companies suffer huge losses due to this price war among the market. Moreover, it has also been seen that this price war affects the overall customer’s perception regarding any products. Therefore, it could be said that this price war overall affects the quality of the products (Association for Consumer Research, 2018). Furthermore, this price war also causes customer dissatisfaction and these impacts the quality of the products. It has been seen that almost half of the companies get impacted due to this price war. In this case, Bharti Airtel Limited gets affected due to this Reliance Company on launching Jio network. Therefore, this affected the overall product quality and market price. Furthermore, it has also been seen that in this case, customers get dissatisfied on receiving lower quality of products and therefore, it is essential to understand the impact of a price war on the quality of products (Kotabe & Kothari, 2016). Pricing is one of the most essential criteria that affect the product quality and therefore, it is essential to understand the impact of this price war on products quality. This research study will shed light on understanding and analysing the impact of price war on product quality and dissatisfaction of customers. The main outcome of this research proposal will be to evaluate the impact of this price war on product’s quality. Customers want high quality of products and therefore, this reduced quality of products affected the overall perception of customers. These customers get dissatisfied and this overall affected the profitability of the company. Moreover, it has also been seen that this price war causes customers dissatisfaction due to lower quality of products. Henceforth, it is essential to discuss about the impact of this price war so that companies could take effective steps in order to mitigate the issue faced by the consumers. They should be provided with proper hands high quality of products and therefore, it is essential to understand the impact of this price war. Moreover, it has also been seen that companies believe that this price war could improve the productivity of their companies since this would attract customers. However, it is essential to make them realise that this reduced pricing range would not have attracted customers but they could have been dissatisfied with lower quality of products. Price war has a definite impact on the quality of products and this affects the customer’s behaviour towards any services of telecommunications. Gap analysis: Previous journals do not specify in detail about the impact of price war on quality of products. Moreover, it is also essential to understand customers’ perception towards price war. This price war affects the productivity of the company and this was not discussed in detail in the previous journals. Therefore, this study will detail about price war and its impact of products quality as well as customers dissatisfaction in case of BAL. However, this affected other telecommunication companies like Bharti Airtel Limited. They also started giving its consumer products and services like internet and calling facility however, they fail to grab the attention of their customers (IEEE, 2018). Therefore, it can be said that this price wars effectively affects the quality of the products and this affected the overall profitability if the companies. Reasons behind price war: One of the main reasons behind this price war is to attract customers and to increase market share. 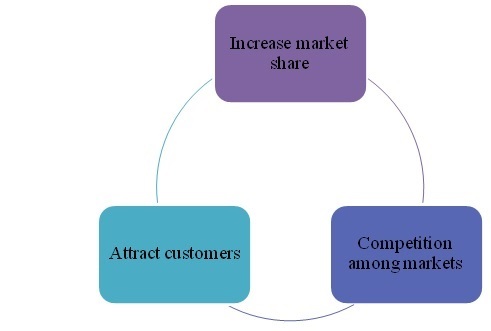 Yadav, Tiwari & Divekar (2015) commented that many companies try to give discounts and reduce their pricing range of products in order to attract customers. These companies believe that reducing the pricing range would attract customers and this would increase the productivity. Gautam (2015) opined that over-competition could also lead to price wars. Most of the companies believe that reducing their pricing range would increase competition among markets and this would overall attract more customers. However, Mishra & Rao (2015) argued that most of the time, it is seen that these companies tend to provide lower quality of products to their customers in order to attract the customers. Therefore, they cut down their pricing range in order to avail to their customers and attract them more to but their services. Competition is another factor that affects price war. Motohashi (2015) opined that in order to meet the demands with other leading telecommunication brand, Jio have proposed to provide free calling facilities to its users. Therefore, this marketing penetration strategy has been used in order to attract customers. Moreover, Sujata, Sandeep & Abhijit (2016) commented that in order to gain market share, most of the companies have proposed to use this reduce pricing range. Therefore, it could be said that this pricing wear occurs in order to grab market position and to penetrate into the market. Moreover, Kotler (2015) opined that most of the companies in order to penetrate into the market reduce their pricing range in order to attain a position in market. Therefore, it could be said that these companies engage in price war while penetrating into the market. Impact of price wars on quality of products: Price wars have immense impact on the quality of products. Arasa & Gathinji (2014) commented that reduced pricing range of the products that are offered by the companies have a huge impact on the quality of the products. It has been seen that this reduced pricing have resulted in lower quality of products. Furthermore, Bhadani, Shankar & Rao (2016) opined that reduced quality of products or services overall affects the business. Reduced rate of the products overall affects the customer satisfaction. Sagar et al. (2015) opined that customers would get satisfied with products when they receive high quality products at affordable price. However, most of these companies try to provide products at affordable prices but their quality are low. Therefore, this affects the customer's perception regarding buying any products. Customers want high quality of products and therefore, in order to curb down the pricing range, most of the companies reduce the quality of the products. Therefore, this overall affects the productivity of the companies. Therefore, this reduced pricing rate overall impacts the customer’s perception regarding. Impact of price wars on customer’s dissatisfaction: It has been seen that most of the customers make comparison between the products they receive. As per the assimilation theory, consumers want to make a comparison between the price and quality of products. They have certain expectations regarding the quality of the products and therefore, this effects customer’s perception regarding their products. Moreover, Kasana & Chaudhary (2014) commented that as per the consistency theory, in case any customer does not receive appropriate products as per their requirements then they get depressed and demotivated. Therefore, this overall affects their cognitive ability and influences customers’ perception regarding any products. Furthermore, it has also been seen that in this case due to price wars, the customers do not get their desired products and therefore they become dissatisfied in availing any services. Most of the customers receive free calls and internet from Reliance Company and therefore, they do not avail to Bharti Airtel Limited due to the high pricing rate of the company. This raised dissatisfaction among them and this overall affects the profitability of the company. Primary and secondary data will be accumulated in order to carry out this research study. These data will be accumulated in an ethical manner in order to prevent any issues while conducting this study. Research methods: The researcher will follow post-positivism research philosophy in order to carry out this study. In this case, a proper evaluation and analysis of price war and its impact on product quality will be evaluated by this research philosophy (Saunders, Lewis and Thornhill, 2010). Therefore, the researcher will choose this post-positivism philosophy in order to draw a conclusion from previous journals and studies. The researcher will choose deductive research approach in order to understand the impact of a price war on customer's perception while availing any telecommunication services. The researcher will choose this approach since there is little scope for identifying and analysing new ideas that are related to the study (Wiegmann and Shappell, 2017). It has been seen that this price war has a definite impact on the quality of products and its effect on customer dissatisfaction will be evaluated with the help of this approach. The researcher will choose descriptive research design while carrying out this study. It is essential to deduce the results in order to analyse the impact of this price war on customer’s perception regarding any products (Yin, 2013). It has been seen that in case of Bharti Airtel Limited, there has been reduced number of customers due to the increased price war among the competitive companies. Reliance Company has initiated this price war by launching Jio and therefore, it is essential to deduce data and information in order to analyse the impact on the customer. Furthermore, Saunders, Lewis and Thornhill (2010) commented that this descriptive design would help the researcher to analyse the qualitative data. The researcher will use both qualitative as well as quantitative data analysis method in order to carry out this research study. The qualitative data will be collected from journals and interviews while the quantitative data will be retrieved with the help of demographic surveys and studies. Primary data collection and analysis: In this case, the researcher will carry out primary quantitative data in order to carry out this research study. The researcher will provide a set of close-ended questionnaire in order to survey customers. These customers will be chosen by a simple random method from Bharti Airtel Limited in order to analyse the impact of price war of their satisfaction. This simple random sampling method will be chosen by the researcher in order to prevent any form of biases while conducting this research study. The researcher will choose this quantitative research method as it is essential to understand the impact of price war on quality of products. Customers of BAL will be better able to analyse this impact on their perception and buying behaviour. Therefore, the researcher will choose this quantitative data analysis method to obtain authentic information regarding the impact of price war. Moreover, the researcher will choose this questionnaire method as this will be less budget exhausting in comparison with qualitative method. Secondary data collection and analysis: Secondary data is the type of academic literature that is already published in books or articles. Wiegmann and Shappell (2017) state the evidence from secondary data are most abundant in nature and can be verified easily. Secondary data source is economical and hence suitable to be used in budget-curtailed studies. Dignified databases and information repositories like Taylor and Francis, Elsevier and Springer will be referred to in the search of valid and transparent information regarding the present issue. Reports and trends on client preference can shed light on the issue. Qualitative data can be retrieved from articles and quantitative data are made available in governmental survey reports. Ethical consideration: Ethical considerations in research studies are standards that enable the researcher to conduct the study from a strong moral viewpoint. Researcher will obtain informed consent from the participants prior to the data collection stage. Any personal data will be archived securely until the conclusion is reached, and destroyed after that. Researcher would also prevent fabrication or falsification of information (influenced by Kasana & Chaudhary, 2014). Researcher will collect and document secondary data to provide in a way that provides ample attention on the original source of the insight or opinion. Compliance to Privacy and Data Protection Act 2014 encourages the researcher to avoid plagiarism in the analysis and documentation of secondary information. The table shows the essential costs to reduce client dissatisfaction in the present price war between Bharti Airtel and its competitors. Installation of fibre optics and a better server would boost the customer service quality. Employee training, incentives and business expansion can also give rise to enhanced services (Bhadani, Shankar & Rao, 2016). Overhead and miscellaneous costs are critical to establishing a healthy and productive task force. Thus from the above information, it can be stated that Bharti Airtel must ensure that the present price war with its competitors does not affect its clientele base. It can be recommended to make further investment to recognise the needs and preferences of the clients. Airtel must expand and strengthen its network by the use of fifth generation server and fibre optics for a better bandwidth. Use of a primary quantitative method has ensured faster recognition of market trends. Secondary information on qualitative and quantitative nature has provided significant evidential backup to the observed primary data. The planned budget has been influenced by essential factors that are linked to the proposed issue. The limitation of this study is its time and budget bound nature. However, the researcher has implemented the available resources to accumulate and analyse the data in a critical manner. Kotler, P. (2015). Framework for marketing management. India: Pearson Education India.